Pavlok Pro Reviews: Will It Help You Break Bad Habits? Manufactured by Behavioral Technology Group, Inc., the Pavlok Pro device promises to help you “wear your willpower” using mild electric shocks that can aid with breaking bad habits. Pavlok Pro Review: Will It Help You Break Bad Habits? Pavlok Pro (also referred to as Pavlok 2) is a wearable device that releases a mild electric stimulus to help you reduce cravings and break bad habits, including quitting smoking, nail biting, hair touching, negative thinking, procrastinating, eating sugar, and just about anything else. The website explains that each voltage surge “trains your brain and weakens the neural connections, until the bad habit is severed.” In fewer than 30 days, we’re told the new action becomes a habit, although they indicate some users report they’re able to make significant progress in less than a week. Then, you’ll replace the newly unlearned bad habit with a good one, such as improving productivity or your overall outlook on life. Together, this process is formally known as aversive conditioning. Place the Pavlok hardware on your wrist. Download the app to your iOS or Android phone, which allows you to adjust zap intensity. Choose your habit module and begin. 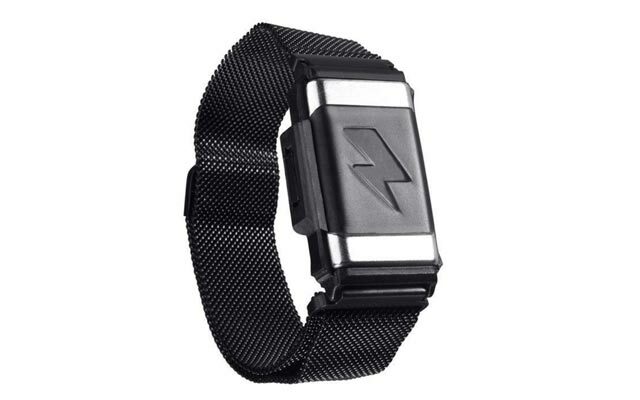 Whenever you perform a bad habit, you’ll press the lightning bolt on the wearable’s face and administer a quick jolt. The company advertises that Pavlok Pro has helped more than 50,000 people break their bad habits, but is the Pavlovian conditioning it provides necessarily the best option for keeping you on track? That’s the central question we’ll focus on in this article. The process is named after Ivan Pavlov, a Russian physiologist who noticed that dogs in his lab began associating the presence of his lab assistant (the stimulus) with food, thereby causing them to salivate. He then started ringing a bell each time the dogs were fed, so they also associated its sound with the presence of food. Once the association was made, he could ring the bell without food in the room, and the dogs would still salivate (called a ‘conditioned response’). The Pavlok Pro wearable works a lot like the bell in Pavlov’s experiments, in that over time, you’ll start to associate a specific thought or behavior with a negative stimulus since it doesn’t feel good. The company advertises that the “fear of loss stimulates your basal ganglia, while the chance of award motivates your prefrontal cortex.” This effectively rewires your neurons so that they associate a specific thought or behavior with this negative stimulus, thereby reducing or eliminating it from your life. How Does the Pavlok Pro Wristband Work? The Pavlok Pro wearable device consists of two main parts: the wristband and the module. Its this technology that can help detect when you’re performing specific hand-related gestures, such as biting your nails, scratching, snacking, and smoking. You can also use it to identify when you’re avoiding your alarm, which won’t turn off until you get out of bed and do five jumping jacks. Once certain gestures are detecting, Pavlok Pro can vibrate, beep, or even zap you with up to 340 volts (described as similar to walking across a rug and touching a doorknob) to create the negative association described earlier. 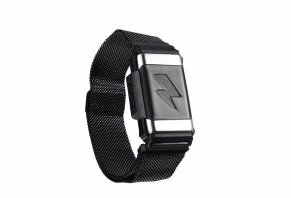 You can also manually press the lightning bolt symbol on Pavlok 2’s face to deliver the same jolt for other behaviors not picked up by the technology, such as thinking negatively. The Pavlok 2 device, with its adjustable, one-size-fits-all nylon wristband and rechargeable module. Credit: Behavioral Technology Group, Inc. In addition to its Sensor Core Technology, Pavlok Pro features a Productivity Chrome Extension, which “allows you to set goals and stay off time-wasting websites,” as well as the eventual ability to integrate with thousands of apps and services via IFTTT. Since Pavlok Pro isn’t a watch, it enters sleep mode when not in use to preserve battery life. In general, though, the FAQ indicates it can deliver over 150+ tiny jolts and will typically last three to five days for most users. It recharges via a micro USB in about an hour. Pavlok 2, is the same size, shape, and weight as the original Pavlok, and comes with all of the same features. Its module is also removable, but instead of a sleek silicone band, Pavlok 2 comes with a nylon version. Unlike the original, this allows Pavlok Pro to learn hand gestures, generate custom notifications (between beeping, zapping, and vibrating) for different behaviors, and eventual integration with a suite of third-party apps, browsers, GPS, and other internet-connected devices. You’ll have access to a full-featured clock (something previously only available in the company’s other device, Shock Clock), which includes sleep tracking, reminders to go to bed on time, and “Snooze-Lock” where you can program different responses to pressing the snooze button (remember the jumping jacks we discussed earlier?). The app includes a built-in remote control that allows you to control Pavlok Pro with your phone, set automated shock options, and even give other people the opportunity to send you a quick jolt. Courses are also available to help you break specific habits, such as smoking, unhealthy eating, and nail-biting (to name just a few). The Chrome-browser Extension referenced above tracks blacklisted websites, the Rescue-Time integration is said to help keep you productive, while the Pavlok-Unlocked feature can clue your coach into your progress. After setting your goals, reminders, and triggers, the app will help ensure you stick to everything by awarding Volts (the app’s digital currency) when you succeed. How Much Does Pavlok Pro Cost? You can purchase Pavlok Pro outright for $295, which includes the one-size-fits-all wristband, electronic module, Break Bad Habits app, USB charging cable, and online access to the quick start guide, instruction manual, evidence guide, and “a course that teaches you the fundamentals behind successfully breaking bad habits and building good ones.” Via the app, you’ll also gain access to all of Pavlok’s habit tracks. Alternately, you can pay for a Pavlok membership—what the company calls ‘CrossFit for self-improvement’—at $49 per month, which delivers the same hardware and list of habit tracks and modules. To initiate a refund or warranty claim, you can email customer service at support@pavlok.com. What Are Customers Saying in Their Reviews for Pavlok Pro? We encountered many different customer success stories on the Pavlok 2 website. But, was it much of the same elsewhere online? On Amazon, we found four reviews at the time of our research, who had given the device an average rating of 3.9 stars. Most compliments referenced effectiveness for breaking bad habits, while the single complaint related to no results and less-than-stellar support experiences. Based on more than 800 combined reviews between iTunes and Google Play, Pavlok’s app held an average rating of about 3.8 stars. Many compliments mirrored those found on Amazon, while complaints typically referenced high price and difficulty pairing. A company representative responded in each instance. Are There Other Bad Habit-Breaking Wristbands Like Pavlok Pro? Perhaps the most similar option we encountered to Pavlok 2 during our research was the HabitAware Keen, with an MSRP of between $149 and $179. As the product in question, Keen helps users address bad habits like hair pulling, skin picking, nail-biting, and thumb sucking by automatically identifying behaviors and sending reminders to stop. It also features app connectivity. Instead of sending a jolt of electricity, though, Keen uses vibration as a reminder, which can be adjusted for detection rate and intensity. Keen can also be used independently of the app, is available in a variety of colors, and allows users to train up to four detection areas at a time. Another wristband wearable that generates gentle vibration reminders is RE-Vibe, which is primarily focused on helping school-aged children stay on task using a proprietary algorithm “to reduce the chance that users get used to reminders.” It retails for $99.95 and doesn’t come with app connectivity. Taking all of this together, if you want access to a bad habit-breaking wearable that uses shock, vibration, and beep reminders, and also features app connectivity, Pavlok Pro is the only product of its kind in the marketplace. How can you decide whether its meaningfully higher price will deliver equally good value? As Kendra Cherry explains in VeryWellMind’s Guide to Classical Conditioning, the fact of the matter is that this process has been shown over the course of decades to (among other things) help individuals decrease their responses to certain stimuli. The exact approach someone uses to accomplish this, though, is mostly a matter of personal preference. For example, some might respond better to the ‘severe' shock delivered by Pavlok Pro, while others might appreciate a gentler vibration reminder instead. If budget is one of your primary concerns, you might be able to accomplish much of the same aversive therapy for a few pennies by placing a rubber band around your wrist and snapping it whenever you perform a bad habit. This also allows you to adjust intensity on the fly. However, you certainly won’t have app connectivity or access to a suite of built-in electronics. After successfully funding the original Pavlok device via a 2014 Indiegogo campaign, inventor and CEO Maneesh Sethi appeared on Shark Tank, where he turned down Kevin O’Leary’s offer due to personality differences. Several other Sharks were concerned about the fact that Pavlok didn’t have clinical support for their claims, although Sethi repeatedly emphasized the thousands of customer responses and testimonials he’d received. Will you achieve similar results, whether related to smoking or another habit? Because habits and their ‘cures’ are intensely personal, the only way to know for sure is by giving Pavlok Pro a try. The company offers a six-month refund policy that begins from the date of purchase, though, and you won’t lose more than return S&H charges if it doesn’t meet your expectations, so you might not have much to lose. Write a Review for Pavlok Pro!